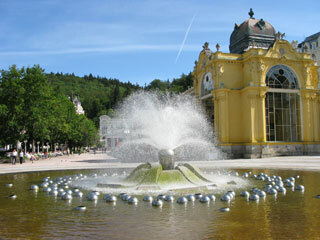 Mariánské Lázne or Marienbad is a spa town in the Karlovy Vary Region of the Czech Republic. The town, surrounded by green mountains, is a mosaic of parks and noble houses. Most of its buildings come from the town's Golden Era in the second half of the 19th century, when many celebrities and top European rulers came to enjoy the curative carbon dioxide springs. This article uses material from the Wikipedia article "Marienbad", which is released under the Creative Commons Attribution-Share-Alike 3.0 License.